The create/edit form allows you to create or edit an item with all the options. 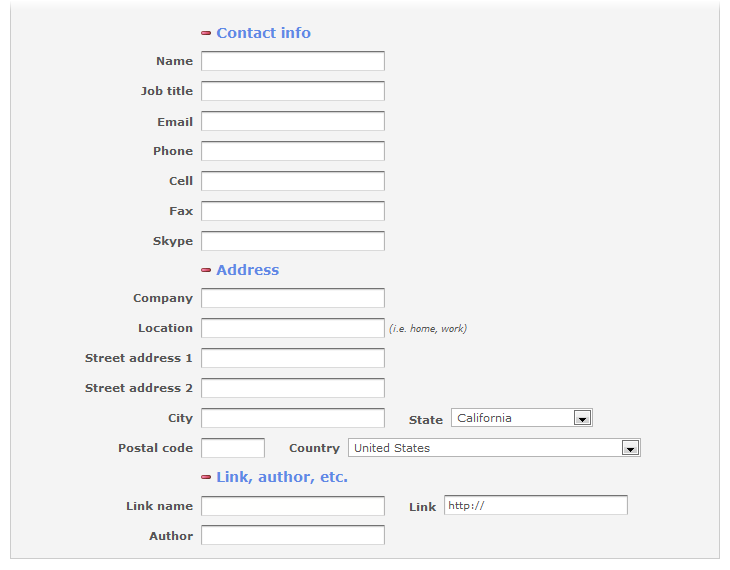 The first section of the form allows you to enter content (such as name, text content, links, etc.). The second section allows you to change the page settings (who can view and edit the page, which folders the page should be placed in, etc.). If you are editing a page, a final section will be available for specifying whether a new version should be saved and for entering a change description if so. What happens if someone tries to edit an item while I am editing it?What happens if someone tries to edit an item while I am editing it? What happens if someone tries to edit an item while I am editing it? 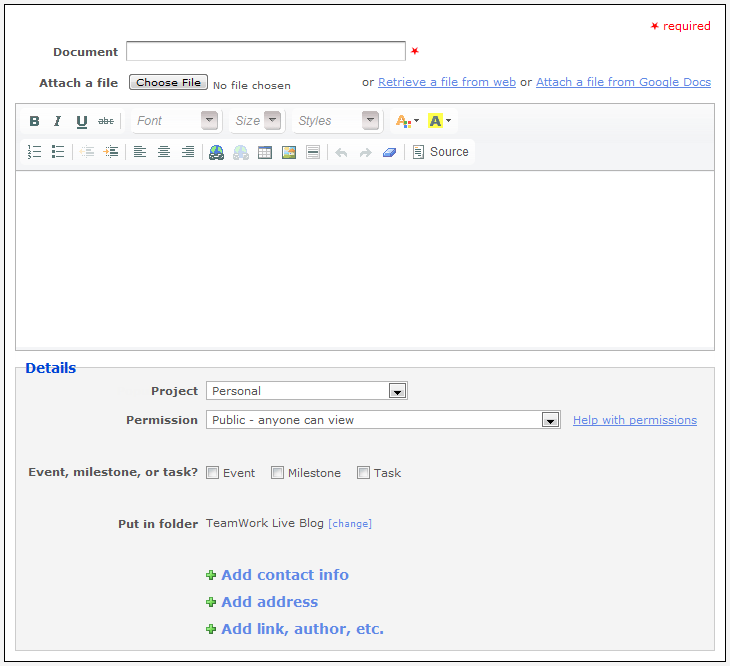 Although multiple users can have permission to edit the same item (such as a team-editable item), TeamWork Live does not allow concurrent modification of an item by multiple users. An itme being edited is automatically locked so that no one else can edit it at the same time. The lock is held for 15 minutes initially, but it can be extended by clicking the [extend lock by 15 minutes] link found in the edit options box (see below). What are the default permission settings for an item?What are the default permission settings for an item? What are the default permission settings for an item? An item being created in a private folder defaults to being private. An item being created in a public folder defaults to being viewable by anyone. A item being created in a non-private project folder defaults to being viewable and editable by any team member. You can change the default settings in your preferences and override them when creating an item. Is it possible for me to create an item that is only visible to me and another project member?Is it possible for me to create an item that is only visible to me and another project member? Is it possible for me to create an item that is only visible to me and another project member? Yes, you will need to make an item a milestone or task to do so: check the box to make the page private, then check the box to make the page a milestone or a task, and finally assign the item to the project member. The project member assigned the item will be able to view and edit the page even though it is private. Where can I get an overview of the possible permissions settings?Where can I get an overview of the possible permissions settings? Where can I get an overview of the possible permissions settings? Please see the help page for permissions. Why can't I assign a task to another user?Why can't I assign a task to another user? Why can't I assign a task to another user? You can only assign project milestones and tasks to another user. Make sure that your item has not been marked private and that you have selected a project for the item. The responsible user list will refresh with the list of your projet members when you change the selected project. In addition, team members on the Free Plan are not allowed to assign milestones or tasks. If you need the ability to assign milestones and tasks, please ask your administrator to put you on a paid membership plan. Why can't I set reminders for my event/task?Why can't I set reminders for my event/task? Why can't I set reminders for my event/task? You need to add either your email address (or email reminders) or your mobile phone information (for text message reminders) to your preferences. Will the people I assign milestones or tasks to be automatically notified?Will the people I assign milestones or tasks to be automatically notified? Will the people I assign milestones or tasks to be automatically notified? Whether assignees are notified that a new milestone or task are assigned to them depends upon their notification preferences. By default, a user's notification settings are configured to automatically notify them via email when they are assigned a new milestone or task. Some users prefer not to be notified of these events because they want to be notified via RSS or by looking at their dashboard. You can force a notification to be sent to an assignee using the notify via email option when creating a milestone or task. The users selected will have their preferences overridden and will be sent a notification email. Why do I get a security warning when using the cut/copy/paste commands from Firefox and how do I get rid of it?Why do I get a security warning when using the cut/copy/paste commands from Firefox and how do I get rid of it? Why do I get a security warning when using the cut/copy/paste commands from Firefox and how do I get rid of it? 1. Install a Firefox plug-in called AllowClipboard Helper. 2. Restart Firefox after installing the plug-in. 4. Click the "Text Cut, Copy & Paste not allowed" link at the bottom right corner of the editor and click "Allow" in the pop-up. Enter the name of the item here. Select the file to upload. You can upload files from your computer, from the web, and from Google Docs (if Google Docs integration is enabled). Enter a description for the item. For example, if the item is a task, you can enter a description of what needs to be done. You can format the text using the rich text edit bar. Select the project to put the item in. Set the permission settings for the item you are creating. Check the milestone, task, or event checkboxes to change the item into a milestone, task, or event respectively. Additional fields will be shown when one of these checkboxes are checked. Click to open the folders list. You can drag folders to the assigned list to put the item in additional folders. Click to expand the fields for adding a contact information (see below). Click to expand the fields for adding an address (see below). Click to expand the fields for adding additional information (see below). You can include additional information with the item you are creating using the additional info fields. You can associate a person and include their contact info with the current item using these fields. You can include an address with the item using these fields. If you want to add a link to another site, enter the name of the site here (ex. Amazon). Enter the URL of the site you want to add a link to (ex. http://www.amazon.com/). Enter the author here. Use this as a way to attribute who created the information and not who created the item. For tasks, select the milestone to associate the task with. Tasks will use the associated milestone's due date and responsible user if one isn't explicitly specified for the task. Assign a priority to the milestone or task. High priority items are always shown on the dashboard of the responsible user. Select the person who is responsible for completing the milestone or task. You can assign to multiple people by clicking on the plus link. Enter a time budget for the milestone or task. Valid values for one hour and 15 minutes is 1.25 or 1:15. Enter a due date for the milestone or task. Milestones and tasks with due dates are also added to the appropriate calendars. Make the milestone or task repeating by selecting a recurrence interval. If you would like the responsible person to be reminded when the milestone or task is due, select the duration before the due date to have a reminder sent. Select the person who must approve the milestone or task once it has been completed. Enter the start date and time for the event. Enter the end date and time for the event. This field is only visible if you have entered a start date. If the event is repeating, select how frequently the event repeats. For repeating events, enter when the event stops repeating. If you would like to be reminded when you are nearing the start of the event, select the duration before the event to send a reminder. The quick add option allows you to create items without having to go to the full edit page. The fields that are available depends upon what you are creating: there are specialized fields for creating tasks, events, and contacts.